In Central and Eastern Europe today the textiles and textile products sector takes a relatively small share in production but plays a major role in employment and, in less advanced CEECs, also in exports. It is considered a labour-intensive, low-skill and low?technology industry, producing a wide range of products (e.g. fibres, threads, carpets, rugs, garments and clothing accessories etc.). The sector was neglected during the former command economy and was further downsized during transition. Outward processing trade with the countries of the European Union probably delayed the decline of the sector, which is expected to proceed in the future. The study investigates the development and prospects of the metals sector in the following countries: Bulgaria, the Czech Republic, Hungary, Poland, Romania, Slovakia, Slovenia. In size, the textiles and textile products sector - in the following termed TC sector (textiles and clothing) - is a small segment of manufacturing in the CEECs today, contributing between 3% and 4% of manufacturing output. It is only slightly more important in Bulgaria, Slovenia and Romania, with 6% to 8%. In the first phase of transition, from 1989 to around 1992, a severe transformational recession hit the region, with the output of the TC sector declining even more than the rest of the economy. After 1993, production continued to fall in most countries and turned positive only in Poland and Hungary. This was due to the loss of the former important CMEA market, slow export growth to the EU (strong competition), persistently low purchasing power on the domestic market, cheap, partly illegal imports e.g. from Asia, and lacking capital and hence investments. The textiles industry was hit in particular, while the clothing industry gained from outward processing agreements. 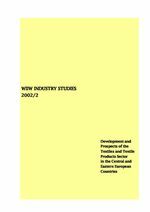 By the year 2000 the TC sector was far below its 1989 production level in all CEECs. In the CEECs wages, productivity and unit labour costs in the TC sector have generally been lower than in West European countries (exception: Slovenia). During transition sectoral wages rose in all CEECs as did productivity, except in Bulgaria and Slovakia. The productivity increase was however less pronounced than in total manufacturing. Estimated unit labour costs also rose (except in Hungary) but still remain at much lower levels than in Western Europe. On the EU market the role of CEE TC exports is prominent but stagnating: in 1995 and also in 2000, CEEC(7) TC exports had a market share of 14% (all shares without intra?EU trade). This share lay significantly above total manufacturing market shares (9% in 1995 and 11% in 2000). On the Austrian market, CEE exports had a decisively larger share, accounting for 26% of Austria's non-EU imports of TC products in 1995, climbing to 39% in 2000. The CEECs' position as an important export destination for Austrian TC exports is also growing (46% of Austria's non-EU exports in 2000). In total, the CEECs registered a trade surplus with Austria (largely due to the Czech and Romanian surplus). The future prospects of the CEECs' TC sector are rather unfavourable. Though the TC sector is competitive today, its situation has deteriorated during transition and will continue to do so in the future. Growth potentials on the domestic market are challenged by import competition, and export competition will increase with the removal, by 1 January 2005, of the ACT quota system in the WTO framework. In addition, the future of the sector depends strongly on developments in outward processing, which might shift further eastward as wages in the CEECs are rising.